Sign the kids up in advance to try hockey for free at Ford Ice Center. Do you have a child that’s interested in playing hockey? Our Nashville Predators have lots of kids excited about hitting the ice! Many local schools and communities are starting their own hockey leagues. 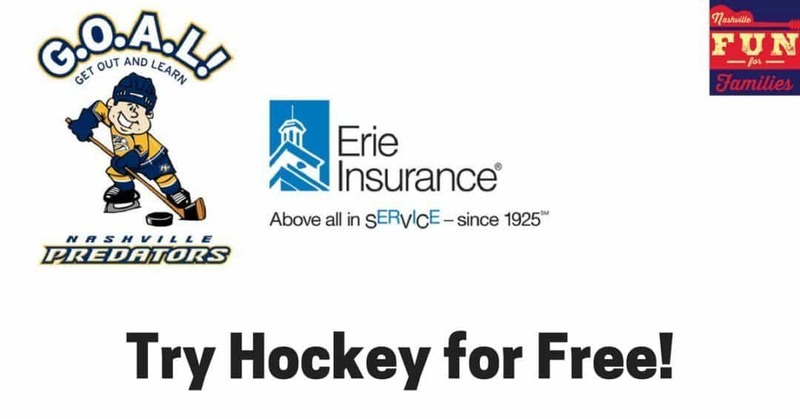 Erie Insurance in association with Ford Ice Center and Centennial Sportsplex have teamed up to create the G.O.A.L! program. G.O.A.L! allows kids to experience hockey without making a commitment to a team or buying equipment. This program runs for four weeks and is FREE! G.O.A.L! teaches kids basic hockey skills and allows them to practice fun drills. Once the four week session is complete, there are more advanced programs offered for kids that want to continue their training. Participants will have access to all the equipment they will need during the sessions and they will receive a souvenir jersey and a graduation certificate once their program is complete. Ford Ice Center also participates in the Try Hockey for Free Program on February 23, 2019. Register now for the G.O.A.L! program at Ford Ice Center.